Updating the 1850’s French Innovation. There are several flavors of anaglyph, but as mentioned the variations are generally in the colors of lenses used, and that for better color rendition. But in our discussion we abandon the concept of color in favor of cleanly represented monochrome depth with anaglyph systems — we are stereo artists, not colorists. With color no longer the concern, we are free to use the RGB color channels of an image as we please. Realizing this, in 2011 while I was on a stereo conversion project in Paris (where anaglyph was invented — what a coincidence), I implemented an anaglyph image system that communicates multiple depth images compactly within a single frame. I call it the Hyper-Glyph**. One of the best methods to better understand an object is to miniaturize it. Large objects and environments are hard to “get your head around” at times, and a miniature more clearly defines the relationships between features. In stereo images, especially during stereo conversion, we use hyper-stereo to change the depth of a scene, and bring the distance relationships into greater relief (see The Art of Seeing Stereo 3D). It is necessary to use other ways during conversion to evaluate an image, so the shading and lighting of a scene do not fool the conversion artist’s perception. Hyper-stereo image pairs are one way to do this, as they miniaturize and exaggerate the depth, making it easier to detect anomalous artifacts. 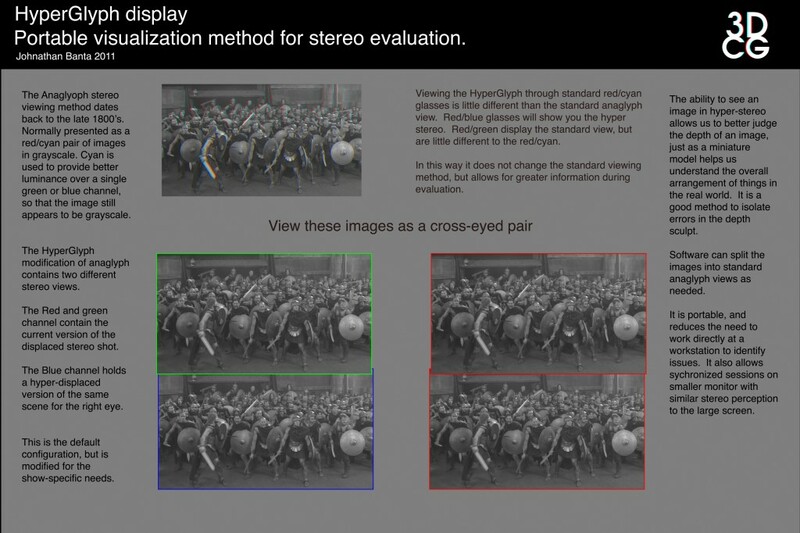 It is one of the better ways to diagnose the distortion of an object in stereo conversion. It was common practice during this stereo conversion project production to flip back and forth between the hyper and standard converted stereo pairs to look for these anomalies — well, as common as possible. It is a technique my teams have used since the first stereo converted live action movie — Lions 3D. However, due to the global nature of the current production team, and multiple vendors, shipping two different image sets across the internet for daily reviews was inefficient. To overcome the data challenge, and accommodate the widely traveling team, I decided to modify the compact and efficient anaglyph format to include both views. Composite Images Courtesy Relativity Media, LLC. ©2011 All Rights Reserved. It is actually simple, once you throw photorealistic color out of the equation. A boilerplate Anaglyph image stores it’s depth information with left eye in the red channel, and right eye in blue/green (forming cyan). 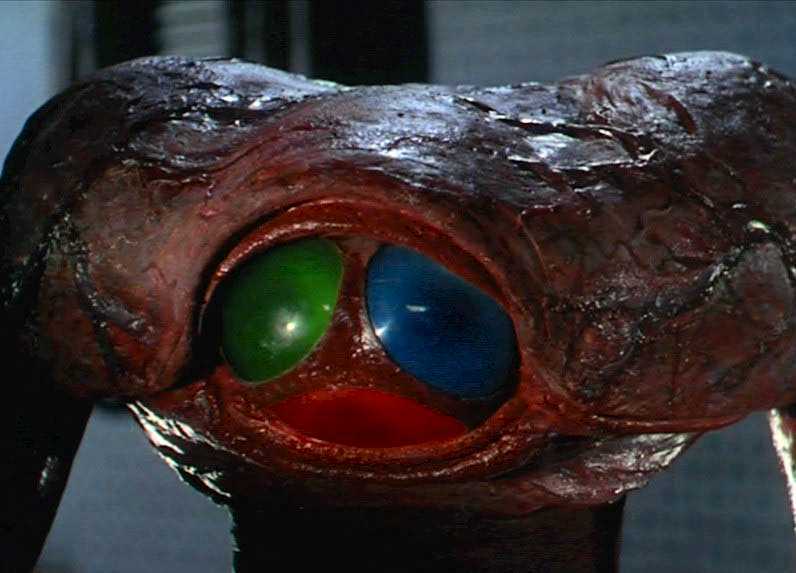 A Hyper-Glyph stereo image, on the other hand, stores the normal stereo pair in the red/green channel, while pushing one eye of the hyper-stereo image into the blue channel. Since image luminance is stronger in green than blue, the preferred fusion is easily viewed with red/cyan glasses, or red/green glasses, but red/blue glasses display the hyper-stereo pair. Within a single image set, multiple stereo views are compactly presented by multiplexing the color channels. The images are easily generated, and efficiently minimize data requirements, while providing more information and portability. Hyper-Glyph viewing is also useful for natively shot stereo productions, especially when more than two cameras are involved. There are stereo camera rigs, such as MIO 3D, that record with more than two lenses, and at various inter-axial distances to capture stereo experiences for multiple presentation formats. The Hyper-Glyph is useful for quickly distributing dailies over the internet (via protected services, of course) for depth analysis of this format. Since there are three images photographed but not equal distance from each other, there are three possible stereo combinations. With the Hyper-Glyph in default setup, the progression of green/blue, red/green, and red/blue reveals an ever expanding depth image. Viewing these different combinations is merely an exercise of looking through the appropriate filters. MIO 3D cameras photographed three views, seen in Hyper-Glyph. 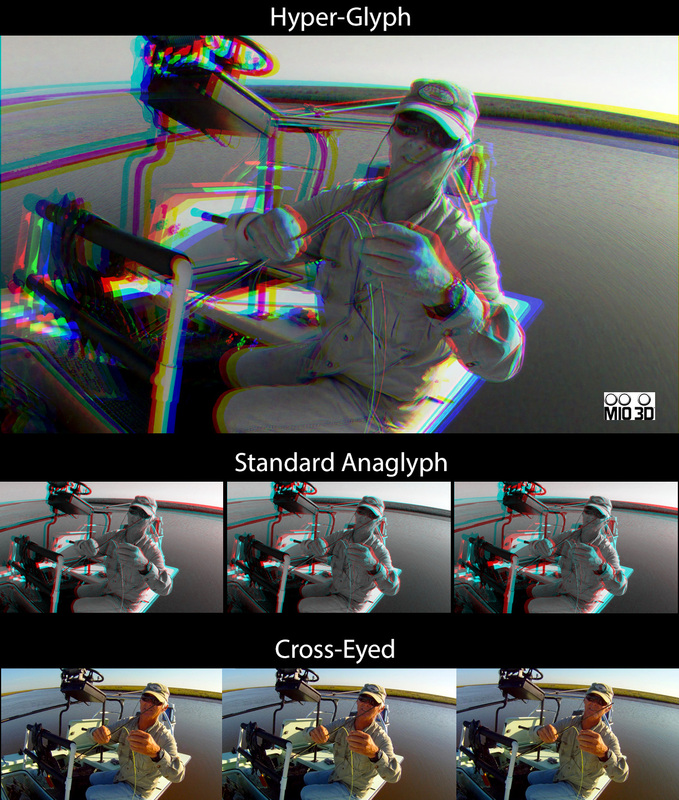 Compare the number of views in cross-eyed and anaglyph fusion necessary to present the same amount of data. Hyper-Glyph can also be used to present a data stream, edge detection, or rectified images to compare with the original. Each channel is just a box of data, that you happen to be able to fuse when properly viewed. The adventurous can even use image sets with alpha channels, to represent more stereo information, but those require special software based viewing systems to switch between channels. This is about compacting multiple bits of data, so as to efficiently evaluate depth, not force anyone to purchase multiple sets of glasses. Specific viewing software that splits the channels back into clean red/cyan anaglyph views eases the experience for the viewer, and negates the need to have multiple glasses available, and since we are likely viewing the content on some form of computer screen, having a system to show off expanded content in a single image set is a good idea. Part of this exercise is to minimize data for teams around the world, the data will need to be compressed. Compression codecs do not like anaglyph pairs, generally. Standard JPEG video compressors create too much cross talk between the channels; rendering them useless. The artifact does not always appear in a still image with similar compressors, but is more often associated with video streams. The JPEG 2000 video codec, on the other hand, at a very low compression setting creates images that are stable enough to be extracted from the anaglyph, and converted for projection for the Stereographer, as well as viewed natively. We touched on it in the last post, but while I was in production, this was faster than standard shipping methods, after which the full resolution uncompressed color pairs were viewed as they arrived across the network. It is important to take time to research the compression settings per channel. 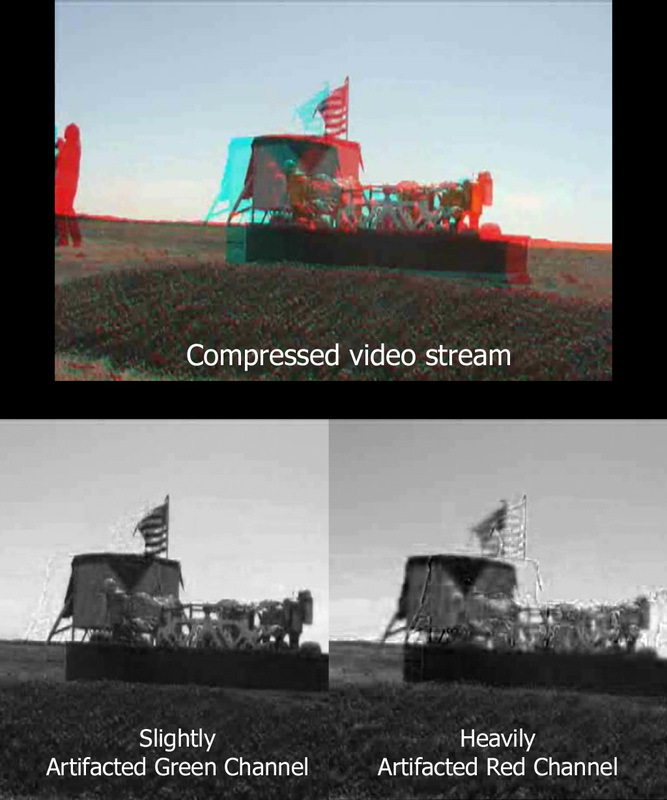 Bad anaglyph presentation over compressed video streams is one of the issues driving people from the format, and can affect you in client reviews over internet video streams. The issue of horrible artifacts in anaglyph due to compression was clearly shown on an episode of NASA tv just recently. I am sure the broadcast was clean (after all these guys build spaceships, right? ), but once the satellite television had it’s way with it, stereo images from the left and right eyes created artifacts in either color channel, and it was a confusing mess. Spend the time to do it right, and you will be happier. This image from a NASA film, aired on Cable TV with this compression. It is heavily artifacted by the compressor, which cancels out any stereo3D fusion. It is occasionally necessary to modify 3D glasses for greater comfort when viewing the blue channel, depending on the density of the lens. Blue lenses are sometimes very dense, and minimize image brightness as they try to cancel out any cross-talk from the green channel. This makes the image from the very bright red channel hard to see, and fuse in stereo. However, it is a simple matter to cannibalize a second pair of 3D glasses and add an extra filter to the left eye if need be. This will balance image density naturally. I will upload the original research paper for this after the next post. 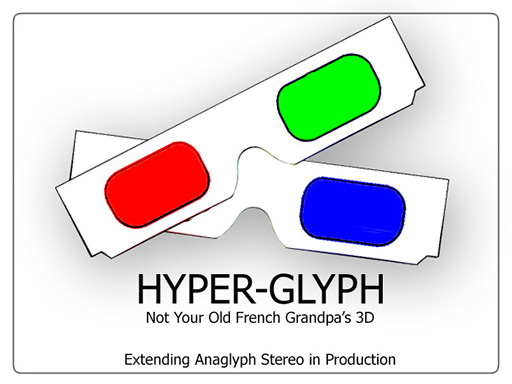 Suffice it to say for now, that Hyper-Glyph is a simple and effective method to transport multiple stereo views with low data overhead. It solves many issues that actually popped-up in the heat of production, and is now a part of my standard stereo toolkit. Enjoy temporarily disabling your color vision for efficiency, my friends. Next in the series: A Stereo Markup Standard — Communicating sculpture with scribbles. “Let’s see why you look so interesting to them.” was the line in War Of The Worlds — Now we know why: Hyper-Glyph. *Special thanks to Sean Fairburn for the use of the MIO images. 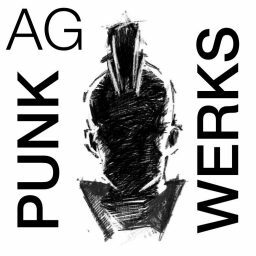 Also special thanks to the artists of Mikros Image who endured my experimenting with the stereo format during Production. ** The spelling of Hyper-Glyph with the hyphen is intentional (like Spider-Man). There are many uses of the term that are inaccurate, and buzz-wordy all over the web. This is to make it distinct from those uses, and an attempt to properly describe its usage in production.